Unlike laws for drunk driving limits, which are fairly uniform across the U.S., regulations on driving with marijuana in your system vary from place to place. Six states enforce specific limits on how much THC, the main psychoactive element in marijuana, drivers can have in their blood. Twelve others have zero-tolerance policies. Most states, however, still lack concrete marijuana laws for motorists, according to the Governors Highway Safety Association. The point at which stoned drivers are considered “impaired” fluctuates by state, but if you’re found guilty of driving under the influence of drugs, or DUID, you will likely face an increase in car insurance rates at your next renewal time, no matter where you live. To give you an idea of how high your rates could leap, NerdWallet looked at car insurance quotes in five states for drivers with a DUID, which can encompass other substances as well as marijuana. California car insurance rates were the most affected in our price sampling. Our research found that rates in the Golden State jumped by more than $1,500 per year for a first DUID conviction. Ohio had the smallest increase, $336 per year on average. Higher auto insurance rates are just one of the possible costs drivers face if charged with a severe moving violation. Those convicted of driving high could also have to pay steep legal and court fines, drug-treatment program costs and a driver’s license reinstatement fee, among other penalties. All told, a single DUID could mean thousands of dollars down the drain. We also tested rates for drivers who receive a repeat DUID citation within a year of their first conviction. If you’re hit with a second DUID conviction, expect rates to spike by several hundred dollars again. Having multiple serious moving violations on your record also increases the chances that your car insurer will drop you at renewal time. If you have trouble qualifying for a policy with another company, you may end up looking into coverage for high-risk drivers. Because insurance companies treat accidents and violations differently, consider shopping around if you’ve recently been convicted of driving under the influence of marijuana. The company that offered the cheapest rate the last time you searched for a policy may no longer have the best deal. NerdWallet’s car insurance comparison tool lets you view quotes from multiple companies. 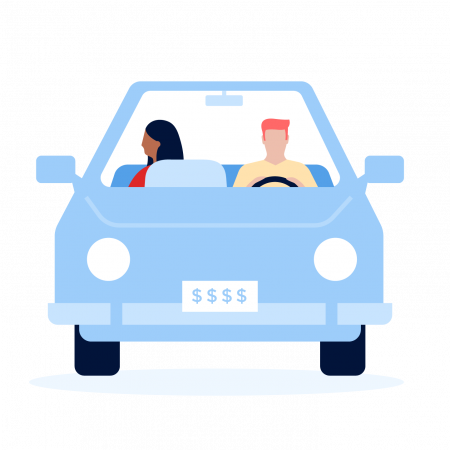 To estimate the car insurance increases after a DUID, we first ran rates for 30-year-old drivers with no accidents or violations, then we ran rates for those with one and two convictions. We did this by averaging the three lowest rates from the largest insurers across 10 ZIP codes in California, Colorado, Ohio, Texas and Washington. Coverage included 100/300/50 liability insurance limits, 100/300 uninsured motorist bodily injury coverage, and collision and comprehensive with a $1,000 deductible. We used a 2012 Toyota Camry in all cases. These are sample rates generated through Quadrant Information Services. Your own rates may be different.